"I'm pregnant, we're breaking up, and it takes time." 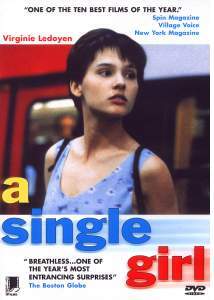 A Single Girl (La Fille Seule) stars Virginie Ledoyen as Valerie, a young Parisian woman starting her first day as a room service attendant at an elegant hotel. She meets with her unemployed boyfriend Remi (Benoit Magimel) before going to work to inform him that she is pregnant, though she's not sure what she wants his reaction to be. She talks to her mother on the phone several times during the course of the morning, but has a hard time engaging in a real conversation with her. Valerie's first morning on the job and her encounters with new co-workers and hotel guests (pleasant and otherwise) lead her to make some important decisions about her life. The film ends with a look at the positive and negative results of her choices two years down the road. The film is paced (though not shot) in "real time," with long sequences devoted to mundane activities—Valerie walks from one place to another, prepares continental breakfasts, rides in elevators, and otherwise goes about her morning. Director and co-screenwriter Benoit Jacquot invests a lot of footage in these insignificant events because they're more important in the aggregate than they seem at first glance. Valerie makes some critical choices during the brief period chronicled in this film, but they don't emerge as dramatic, full-blown revelations—rather, her observations, brief small-talk conversations and impressions of people's personalities and experiences all contribute to her ultimate decision. Jacquot's point seems to be that life never really stops for the "big events," but weaves itself around them—we're influenced consciously and subconsciously by everything that happens to us. A Single Girl explores this idea with a leisurely fascination, abandoning flashy cinematic pacing and structure to build a cohesive narrative out of sequential bits and pieces. The film's emotional impact creeps up on the viewer almost imperceptibly, but the whole is much greater than the apparent sum of its parts. Fine performances from Jacquot's cast help make A Single Girl convincing and affecting. Ledoyen plays Valerie as sweet, attractive and a bit immature, yet strong and independent; the supporting actors deliver naturalistic performances, full of pauses, false starts and other artifacts of real human interaction. The film has a pseudo-documentary feel about it, lit simply and unobtrusively, with no musical score but near-constant background sounds, and all of the production elements support the movie's style and goals effectively. In some of the outdoor street scenes, curious bystanders can be seen looking directly at the camera, but the film is otherwise technically sound and emotionally satisfying. Casual viewers should be aware that the film is in French with English subtitles, and while this unrated film is generally tame, it contains one graphic sexual moment that means to be shocking and succeeds. Image Transfer Review: Fox Lorber's DVD of A Single Girl is presented in its original 1.85:1 widescreen aspect ratio, with a non-anamorphic transfer (the box is mislabeled as a 1.66:1 transfer.) The source print has a fair amount of dirt flecking, but the digital transfer is pretty solid, with good black level and detail. There is what appears to be some video chroma noise in a few shots with red carpets, and some subtle grain and softness in the image throughout, but this is an above-average transfer (considering the relatively low-budget 1995 source) with no distracting defects. Audio Transfer Review: A Single Girl's well-designed but simple soundtrack shouldn't be a particularly difficult digital challenge, and it's well-preserved on this DVD in its original monophonic mix (encoded in Dolby Digital 2-channel mode for decoding through the center speaker; the DVD case's claim of Stereo audio is inaccurate.) There's no musical score or dramatic sound effect content as such in the film, so the frequency range is inherently narrow and any analog hiss is well-masked by the film's constant background atmospherics. Intimate, quiet dialogue is well-captured, and even though the film is in mono, nice Foley work varying volume levels to match onscreen action creates a respectable illusion of directionality. No bass or home-theatre demo material here, but fine sound design and a solid digital transfer earn this disc a good grade in the audio department. Lists of films and notable awards (but no biographical information) for director Benoit Jacquot and cast members Virginie Ledoyen, Benoit Magimel, Dominique Valadie and Vera Briole. A simple DVD Production page crediting the producers and menu designer. A simple DVD-ROM HTML file linking to Fox Lorber/Winstar's website; on standard DVD players, the website address is displayed so everyone can visit. A Single Girl requires some personal investment—you can't pick it up in the middle and expect to get the full effect, so be prepared to set aside some time, read the subtitles and absorb a quiet little slice-of-life film that has a lot to say in the final analysis. This is one of the better DVD transfers I've seen from Fox Lorber, marred only by the lack of supplements, and it's a fine movie. Recommended.